We are honored to present our latest creation of a life size bronze soldier statue for our Veteran memorial collection of bronze sculptures. As you can see in the pictures this is an exteemly detailed sculpture of a male soldier in full combat uniform. The sculpture measures 6 feet tall and approximately 40" wide from the elbow to the end of the rifle. He is mounted on a 24" x 24" plate bronze base. Four (4) mounting nuts are welded under the base for installation. We realize this sculpture is expensive. However, a custom soldier statue of this nature would typically cost around $65,000 - $75,000. It took over six months to complete, and is cast from over 200 pounds of bronze. However, the owner of The Large Art Company is a veteran and has devoted the past 16 years making sculpures for veteran memorials. He invested his time and money to make the original sculpure to add this piece to the Veteran memorial collection. Hopefully the original cost will be covered over time. The point is this is an excellent value, and there is nothing comparable on the market at any price. 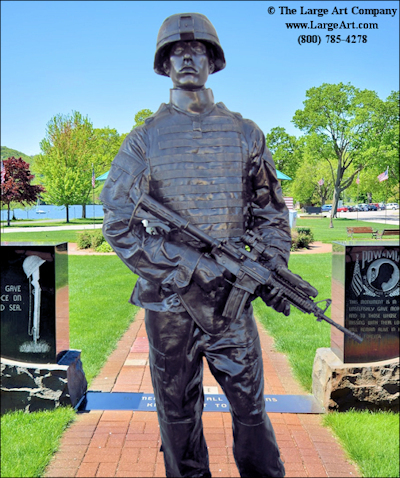 After an early career as a software engineer, Mr. Rist has dedicated the bulk of his adult life providing bronze sculpture for military and veteran memorials and monuments. He was honored to be recognized by VFW Magaine in May 2017. Please call us toll free at (800) 785-4278 to reserve one of these for you. These are made one at a time. If we have one made it can be delivered in two weeks. A new casting will take about 6-8 weeks.. There are many options to display this sculpture. The underside of the plate bronze base has four mounting nuts for anchoring the sculpture to a solid surface. click here for installation instructions.